After yesterday’s internet leak, Mercedes-Benz went ahead and released all the official data on its subtlety revised 2009 A-Class hatch prior to the car’s public debut which is set for the April 5 at the Leipzig Auto Show in Germany. In a nutshell, the A-Class has received minor aesthetic changes in the front and rear end while inside, it features larger stowage compartments and new fabrics. The new-generation A-Class will be stepping into the limelight at the “Auto Mobil International” (AMI) motor show in Leipzig from 5th – 13th April, 2008. Following an extensive facelift, the successful compact car is younger, more attractive and more environmentally friendly than ever before. The convenient ECO start/stop function is available for the first time for the high-volume A 150 and A 170 models, which reduces fuel consumption of these BlueEFFICIENCY vehicles by up to nine percent when driving in city traffic. Mercedes-Benz has developed an additional BlueEFFICIENCY package for the three-door A 160 CDI, reducing the Coupé’s fuel consumption to just 4.5 litres per 100 kilometres. Independent experts have confirmed these major environmental advances by awarding the A‑Class an internationally valid Environmental Certificate – the world’s first compact car to receive such an accolade. Since its world premiere in 1997, the A-Class has made a name for itself in the compact-car class as a trendsetter and groundbreaking innovator. Outstanding safety, everyday versatility and hallmark Mercedes reliability have always been the strengths of the A-Class, whose distinctive yet equally versatile concept has won over more than two million drivers since its launch. The new-generation A-Class builds on these virtues: Mercedes-Benz is presenting a range of five-door saloon and three-door coupé versions in spring 2008, each sporting an all-round upgrade. 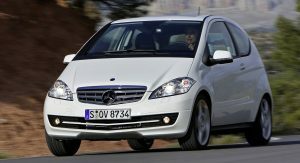 The front end of the compact Mercedes-Benz is younger, yet at the same time more poised and assured than before. The sweeping lines of the new-look headlamps flow seamlessly along the front and into the flanks, which literally appear to have been moulded from a single piece. The equally redesigned bumper reinforces this impression; its air intake at the bottom is noticeably larger, emphasising the width of the body. 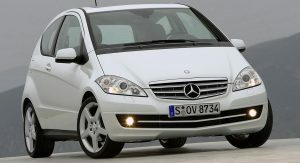 The radiator grille has also been redesigned to reinforce the progressive character of the A‑Class. Design elements at the front help differentiate the A-Class lines even more clearly than before. For instance, the AVANTGARDE line features a specially designed bumper that further emphasises the arrow shape of the front and symbolises even more agility. Individual wheel designs help differentiate the side view of the A-Class lines. 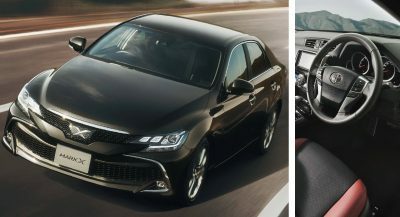 While the entry-level model comes with 15‑inch wheels with 7-spoke trim, the ELEGANCE and AVANTGARDE lines sport individually styled 16-inch light-alloy wheels. The new, larger exterior mirror housings and the door handles are now painted in the vehicle colour on all model variants. The rear of the A-Class is dominated by a modified bumper and new-look tail lights that extend well into the flanks. Both features ensure that the body looks wider and even more powerful. The Mercedes designers also paid particular attention to increasing perceived value when it came to revamping the interior, selecting a range of new high-grade upholstery fabrics and door trim. In addition, new trim elements made out of smoke grey, diagonally brushed aluminium add an upscale feel to the interior of the AVANTGARDE line, while the distinguished ambience of the ELEGANCE model is reinforced through wood trim elements. All variants of the A-Class come with a larger stowage compartment in the centre console and a new-look cup holder between the front seats. The new-generation A-Class emphasises its economy with fuel consumption of between 4.9 and 8.1 litres per 100 kilometres. Thanks to further detailed enhancements, fuel consumption of the sophisticated direct-injection diesel engines has been reduced by over 8 percent or 0.5 litres per 100 kilometres compared with the outgoing models. 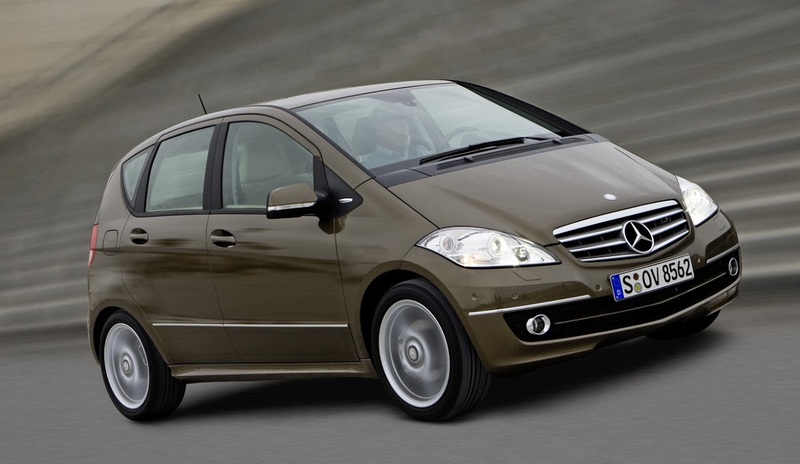 From autumn 2008, Mercedes-Benz will supply a standard-fit BlueEFFICIENCY package for the three-door A 160 CDIwith manual transmission, which further improves engine efficiency, aerodynamics, rolling resistance, energy management and weight. Taken together, these measures add up to a fuel saving of 0.4 litres so that the A 160 CDIBlueEFFICIENCY consumes just 4.5 litres per 100 kilometres on the NEDC cycle. CO2 emissions of the 60 kW/82 hp coupé are 119 grams per kilometre. The BlueEFFICIENCY package includes an aerodynamically optimised radiator grille, the rear side of which is sealed off, thus reducing the volume of air flowing into the engine compartment; despite this, sufficient cooling for the CDI engine is ensured at all times. The bodywork has also been lowered by 10 millimetres to further reduce wind drag. The Mercedes engineers have leveraged further potential to save fuel by dynamically controlling the power supply on board the A 160 CDI BlueEFFICIENCY to save energy. The generator management system consistently converts the power generated when the engine decelerates (i.e. on the overrun) into electrical energy, which is then used to recharge the battery in an optimum, energy-efficient manner. The Mercedes engineers have achieved fuel savings for the petrol-engined models of up to 0.4 litres per 100 kilometres on the NEDC cycle thanks to the newly developed ECO start/stop function. 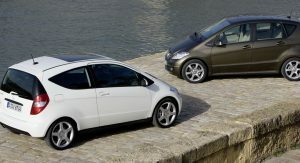 This system will be available for the high-volume A 150 BlueEFFICIENCY and A 170 BlueEFFICIENCY models from autumn 2008. It automatically switches the engine off when the driver shifts to neutral at low speed whilst depressing the brake pedal. A special display in the instrument cluster informs the driver if the conditions for switching off the engine are met. The moment the clutch is pressed or the brake pedal released, the engine springs back to life almost noiselessly and in a fraction of a second. This ability to restart the engine swiftly yet smoothly gives the Mercedes technology a key edge over other systems of this type. The ECOstart/stop function further reduces fuel consumption by around 6.5 percent on the NEDC cycle. The A 150 BlueEFFICIENCY (70 kW/95 hp) completes the cycle with fuel consumption figures of 5.8 litres per 100 kilometres , the equivalent of 139 grams of carbon dioxide per kilometre. Even greater savings can be made in urban traffic, as the results of extensive field testing show: Mercedes employees have tested the system in 175 test vehicles, notching up some 1.2 million kilometres in the process. Around half of this marathon testing schedule involved driving on urban roads where the new ECOstart/stop function produced fuel savings of up to nine percent. These kinds of practical results are all-important to Mercedes-Benz when itcomes to assessing new technologies. The Stuttgart-based brand assesses the environmental compatibility of vehicles not just on the basis of the results of standardised exhaust emissions and fuel consumption measurements but also looks at the entire lifecycle – from manufacture through use over many years to end-of-life disposal. The analysis of more than 40,000 individual processes provides a complete picture that helps the engineers objectively assess development work. This lifecycle assessment forms the basis for the Environmental Certificate based on the stringent international ISO standard 14062 “Design For Environment” which the A-Class is the world’s first compact car to receive. 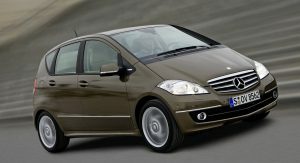 Mercedes-Benz has put together a brochure including detailed information onthe eco balance sheet and the Environmental Certificate. This brochure is available on the Internet at www.media.daimler.com . 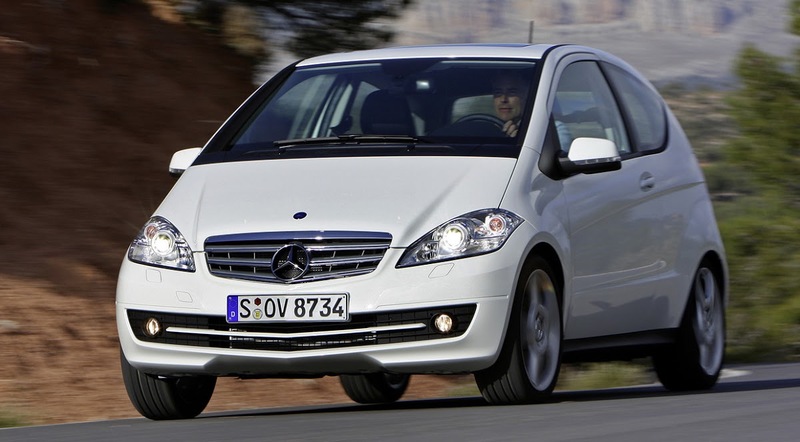 Mercedes-Benz has also enhanced safety and comfort in the A-Class. 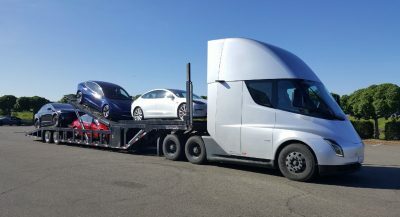 Technology from the luxury-class segment has found its way into the compact car with the adaptive brake lights, which add another accident prevention system to the standard specification. During emergency braking when travelling at more than 50 km/h, the brake lights flash at high frequency to warn drivers behind who can consequently react faster and are in a better position to prevent an accident. The A-Class also sets new standards in this market segment in the area of occupant protection with two-stage front airbags, belt tensioners for the front and outer rear seats, belt force limiters, active front head restraints and head/thorax sidebags. Mercedes-Benz is now complementing this extensive safety technology with crash-responsive emergency lighting in the interior, which comes on automatically after an accident of a defined severity to provide occupants with better orientation and make the task of the emergency services easier. 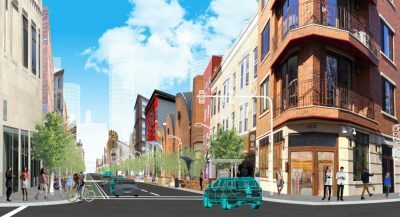 In future, A-Class owners will have assistance looking for a parking space and when reverse parking, courtesy of active parking assist, which is optionally available for all model variants. Using newly developed ultrasonic sensors on the sides the system looks for an appropriate spot on either side of the road as the A-Class drives by and informs the driver via a display in the instrument cluster. Once a suitable spot has been found, an arrow also appears in the display, informing the driver on which side of the road the parking spot is located. If the driver selects reverse, accepts the suggested space and depresses the accelerator, active parking assist takes over and manoeuvres the A-Class automatically into the space. The driver simply needs to press the accelerator pedal and use the brake; the ultrasonic sensors associated with PARKTRONIC provide assistance and information on the distance to the vehicle in front of and behind the A-Class. To be able to use the automatic parking feature, the parking spot only has to be 1.30 metres longer than the A-Class – an indication of the technology’s tremendous precision. Thanks to the very compact dimensions of the A-Class, a parking space of just around 5.19 metres long is sufficient to park; no other car can automatically park in such a small space. The Mercedes engineers have added a new function to the tried-and-trusted assistance system on the A-Class: the Electronic Stability Program (ESP®) on the A-Class now comes with automatic hill-start assist, which prevents the compact car from rolling backwards if the driver moves his or her foot from the brake to the accelerator pedal when moving off on an uphill slope. 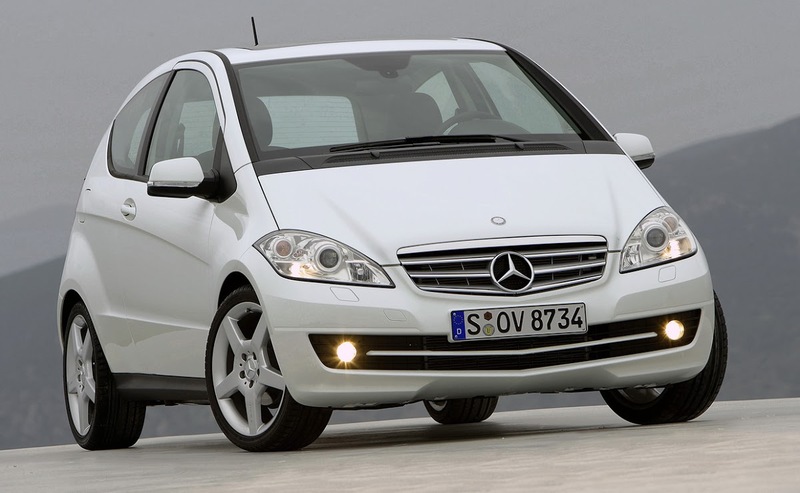 Just like all the other new Mercedes models in 2008, the A-Class also comeswith enhanced units that provide information, communication, navigation and entertainment. The new Audio 50 APS is fitted with a colour display, Europe-wide DVD navigation system and DVD drive, while the top-of-the-range COMAND APS includes hard-disc navigation, Music Register, a slot for SD memory cards and a voice-operated control system. The newly developed, interactive media interface provides even more options for in-car listening pleasure by allowing an optional MP3 player, USBstick or another external audio device to be connected to the A-Class infotainment system. Previous PostPrevious What’s The Most You’ve Ever Paid For a Car Service? Next PostNext Supped Up Alfa Romeo 8c Competizione 590Hp on Sale for $600k! Following his release from jail, Ghosn will be closely monitored and not allowed to leave the country. The South America-only Argo Trekking is a subcompact all-rounder that starts at just under $15,000.